This past weekend at the Medal of Honor convention’s Patriot Award Gala in Knoxville, Tenn., CNN anchor Jake Tapper, author of The Outpost: An Untold Story of American Valor, received the ”Tex” McCrary Award for Excellence in Journalism. He accepted the award from Gary Wetzel, a 1968 Medal of Honor recipient. 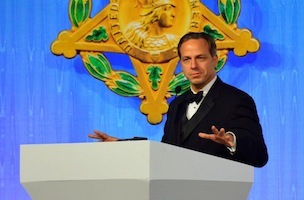 Gary Sinise, who portrayed Lt. Dan in “Forest Gump,” served as master of ceremony. US Supreme Court Associate Justice Samuel Alito Jr., an Army veteran, was also in attendance and received the Patriot Award.